What is the process for creating a brace or prosthetic for a pet? 1- Review ALL your pets records, not just orthopedic records prior to your visit: Other illnesses can affect how a brace will work. Dogs with Cushing’s disease will be more prone to sores, dogs with allergies may have more trouble tolerating the brace (if it’s itchy under there) if the allergies are not controlled. 2- Full physical exam and a full orthopedic exam to make sure that your pet is a proper candidate for a device: Some pets need to lose weight before a device will work. Some pets have undetected neurological issues which make it so the physics of the brace won’t work. 3- Photos and consult with OrthoPets® prior to your fitting appointment: That consultation is essential to the proper expectations of the device prior to casting. We need to be sure that everyone has the same goals and understanding of the goals of the device before the investment of time and money is made. 4- Review costs: The cost of the device varies based on our expectations for recovery, goals for return to function, size of the dog, and special needs of the device. Most devices cost between $1000 and $1800 (prosthesis $1500-2000), in addition to casting and consult fees, fitting fees and rehabilitation. 5- Review need for rehabilitation: Rehab is needed with any orthosis or prosthesis. Going back to the shoe analogy – if you never wore high heels shoes in your life, you probably wouldn’t put them on for the first time and go dancing. Same is true for a device. Dogs need to learn how to trust it and use it properly or all that physics goes to waste and the dog won’t bear weight normally in the device. 6- Determine if sedative is needed: We need your pet awake if at all possible to do casting of the leg, many times in a standing position, but some pets need some sedation prior to the appointment. If sedation is needed we will request a prescription from your veterinarian and ask that you do a “trial run” prior to your appointment so we have the best chance of success without stress. Photos and video: We take extensive media so that OrthoPets® has full visual of what we are seeing for best device design. Contract (link): We will review your signed device contract. Deposit: We will have you leave a $700 deposit for the device before you leave. As soon as OrthoPets® determines the final cost to us based on goals, consultation and measurements, we will contact you with the final total cost of the brace or prosthetic. Construction and shipping of your pet’s prosthetic device usually takes 2-3 weeks. Further extensive consultation occurs before construction starts, a double-check system that your pet gets just what is needed. While we do these several times per month, OrthoPets® does several per DAY with extensive orthotic experience and training. We always default to their advice. Fitting the brace: We put the brace on and put your pet through a few paces. Donning instructions: We show you how to put on and take off the brace. Most braces must be donned in a specific order of steps to work properly. We send you home with a video link to watch also. What to watch for: Despite the very best fit sometimes we have issues that must be adjusted. The lining of your device has a wonderful padding that will change color with abnormal wear – our goal being to know where it is rubbing before your pet has a sore. Break in schedule: Some devices are to be worn 24 hours a day and others worked into slowly. We will review this schedule with you. Despite all our checks and double checks, adjustments go with any device. Some adjustments are as simple as moving a strap or changing a pad, others require further at our clinic and still others require return to OrthoPets®. One return to Orthopets adjustment is covered in your contract and 2 at Healing Arts within the first 60 days. We will not fit a brace if there will be no follow up afterwards (but do video appointments for our long-distance travelers). All devices that are long term should be refurbished once annually. Can’t I just do this through my vet? The short answer is yes. 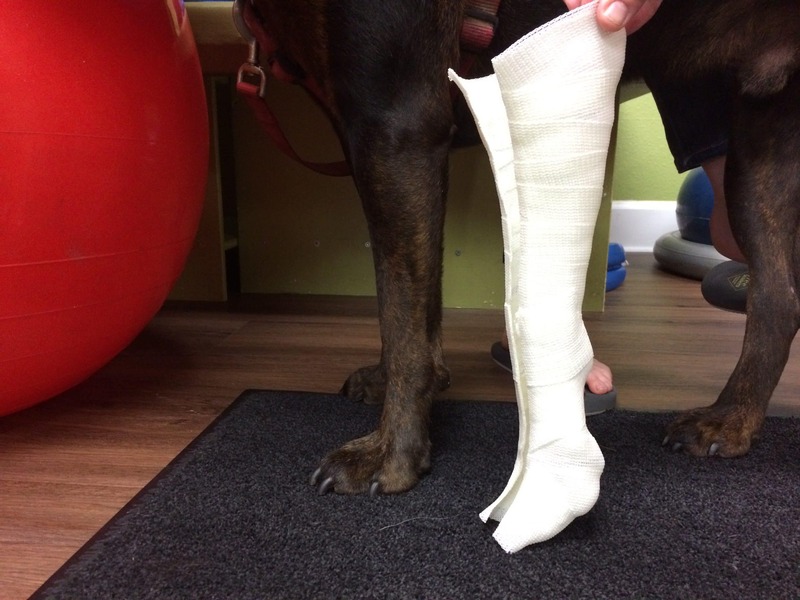 BUT, if the orthotic measurements and fittings are done by an experienced and trained pet rehabilitation professional, the outcome is usually better. Also, the level of skill and knowledge of orthotics manufacturers vary widely, so do your research, as this will greatly affect the outcome for both fit and function of the device. Canine knee braces are special! We get more calls for canine stifle braces than any other device. Most of these calls are from caring owners for whom surgery is not a financial option. If you are thinking about canine knee braces as an alternative to ACL surgery for your dog, there are considerations to keep in mind to decide if that is the right solution for you and your dog. CLICK HERE for considerations for stifle brace. An orthosis is not the correct therapy for all patients, and so before choosing one, the dog owner should ponder fully and thoughtfully all aspects of using a dog knee brace on the injured dog. While a stifle brace can be less expensive than surgery, it is essential to realize that this does not FIX the knee. The stifle brace It is not like a human knee brace, worn only for sport. The orthosis stabilizes the stifle from the outside only—when it’s on your dog. Surgery does so from the inside, permanently. Because of this, the dog knee brace must be used whenever your dog will be standing and/or moving about and because of this, in most cases surgery is the best solution, if medically possible. In addition, if the meniscus is torn in your pet’s knee, even with the device, he will continue to experience significant discomfort. Dog ACL surgery is the only way we can heal a torn meniscus. Dogs that have torn one cruciate are at high risk of tearing the other within the next 3 years. For dogs with surgical repair and rehabilitation, that risk reduces drastically. For pets without surgery, that risk is about 60%. OrthoPets provides stifle brace orthoses for nearly 1,000 dogs per year. This level of experience allows for the careful selection of patients’ best suited for a stifle orthosis, and the company continues to work closely with university professionals at Colorado State University College of Veterinary Medicine to develop studies to prove and improve the use of orthotic devices in animals. The best way to ensure the highest level of success is to follow all recommended dog rehabilitation schedules and techniques. Each patient’s condition and abilities are unique, and, as such, an individualized rehabilitation program is needed. It is important to work with a certified canine rehabilitation therapist/practitioner, or CCRT/P, who will custom design your dog’s physical therapy program. Finances are hard! If a custom canine stifle brace or dog ACL surgery are out of financial reach for you and your pet, please consider rehab alone. We can teach you techniques to slow the formation of arthritis in your pet. Nothing repairs the dog’s cruciate ligament itself, not even surgery. Surgical techniques are designed either mimic the cruciate ligament through repair (extracapsular repair) or change the angle of the knee to not require a cranial cruciate ligament (TPLO). For any prosthetic device or surgery to be success, it has to be designed to stop the abnormal movement of the dog’s knee created by a broken ligament. Only a custom made canine stifle brace can do that, and even then, many styles have been shown in research NOT to stop that motion. In addition, many do not include padding and can be uncomfortable for sitting or lying down.